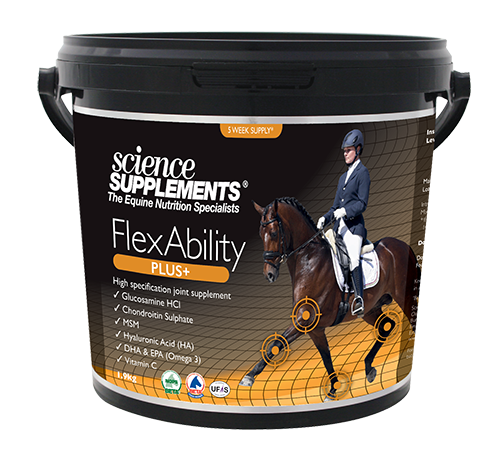 FlexAbility Plus is a high specification supplement from Science Supplements, which provides optimal levels of key nutrients involved in cartilage synthesis and support, including glucosamine, chondroitin, MSM, omega 3 fatty acids DHA & EPA, Hyaluronic Acid (HA) and Vitamin C.
Flexibility Plus contains Glucosamine HCl, Chondroitin Sulphate, MSM, Hyaluronic Acid (HA), DHA, EPA, and Vitamin C in concentrations which make it one of the highest quality joint supplements on the market. The combination of Glucosamine, Chondroitin and MSM provide the nutritional support for cartilage maintenance and repair. DHA and EPA and essential fatty acids which provide anti-inflammatory effects. Vitamin C is a powerful anti-oxidant to prevent free radical damage. It is also tested for prohibited substances under the UFAS BETA NOPS scheme. Effects can be seen in as little as 7 days, but normally by 10-14 days. Feed at a loading rate for 14 days then reduce to the maintenance rate. Simply add to feed, ideally split between meals.